* Please Note: The fireplace's Middle Width must be at least 27 Inches and the Depth must be at least 14 Inches for this gas log set to fit. You can calculate the middle width of your firebox by measuring the width (left to right) approximately half way back in the firebox. If you have any questions, please contact our customer service department and we will be happy to assist you in finding the perfect size gas log set. 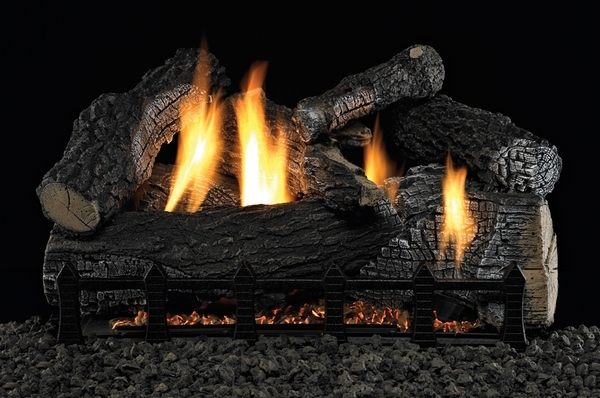 The Empire Super Wildwood Refractory Gas Log Set provides a homey atmosphere with its massive logs and lifelike flames. The massive logs are reminiscent of fresh cut logs brought in from the wood lot and create a down-to-earth backwoodsman feel to your family room. The flames can be controlled by remote control differentiating their height and giving the look and feel of a real fire. The Harmony Burner comes with the option of being unvented, and the whole set can be controlled by remote control and/or your thermostat. The effect is a lifelike fireplace with a classic feel. Does the unit come with a battery remote that will turn it on/off and change flame height? This unit does not come with a remote control but a remote can be added through the unit's accessories section.